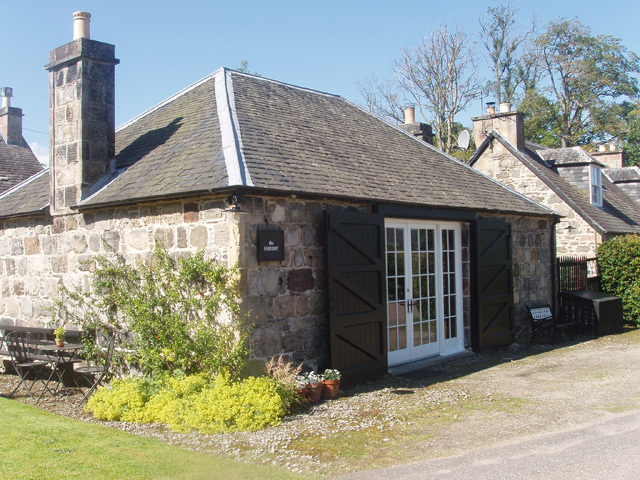 A converted Blacksmith's workshop and forge, Beauly, Scotland. Pet welcome. 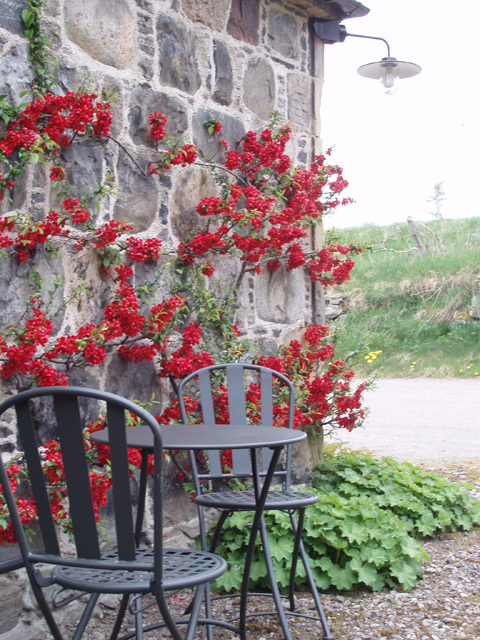 Originally a blacksmith's workshop and forge, the Old Smiddy has been painstakingly converted into a beautiful holiday cottage for couples, an ideal honeymoon tryst which sits in a quiet leafy lane in the heart of the Inverness countryside, just one and a half miles from the village of Kiltarlity and 5 miles from Beauly. 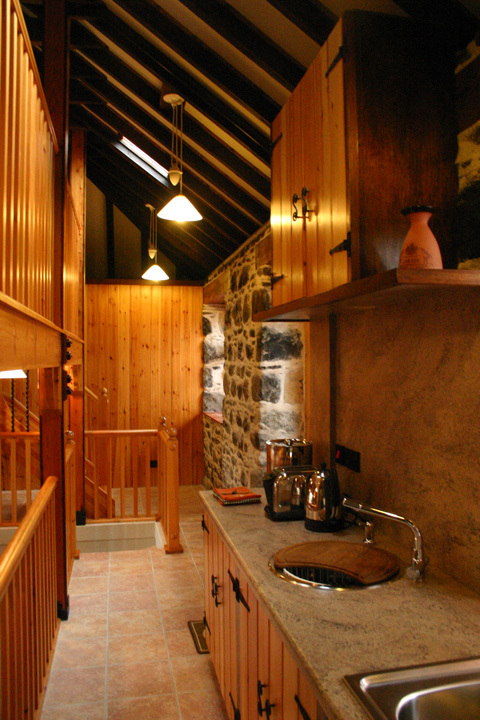 The cottage is unique in its interior design and layout, retaining many original features. It is a cottage where, from the king-size bed on the mezzanine gallery, you can watch the flickering flames from the log fire in the living space below, creating soft lights and dancing shadows on the original roof beams. This is perfect honeymoon accommodation in a perfect honeymoon setting - a quarter mile stroll to the village pub and restaurant and one and a half miles to the village shop and bar in Kiltarlity. Not exclusively for honeymoon couples though - the Old Smiddy will be appreciated by all who stay here. If you are flying to Inverness, the Smiddy is just 17 miles from Inverness airport - even the journey from the airport is breathtaking in parts, so your honeymoon or romantic break will be a unique and exciting experience from the moment you touch down at Dalcross airport. The Smiddy is fully equipped for self catering couples with everything provided to make your stay as comfortable and relaxing as it can be. 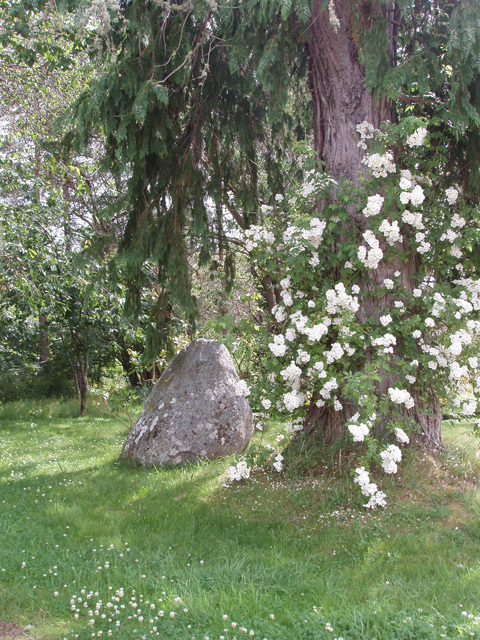 If you are planning a Highland wedding you can even get married in the old estate chapel close by or, perhaps more daringly, get married on Loch Ness. You can charter boats on Loch Ness for weddings and wedding receptions. Whatever your wedding plans are, the Old Smiddy will provide romantic honeymoon accommodation that will exceed your expectations. If you are booking for a honeymoon, wedding anniversary, birthday or just for a special occasion and would like to treat your loved one to champagne, chocolates, flowers or whatever. Please contact us to discuss your requirements and we will arrange this for your arrival. The following facilities are provided for your comfort and convenience. 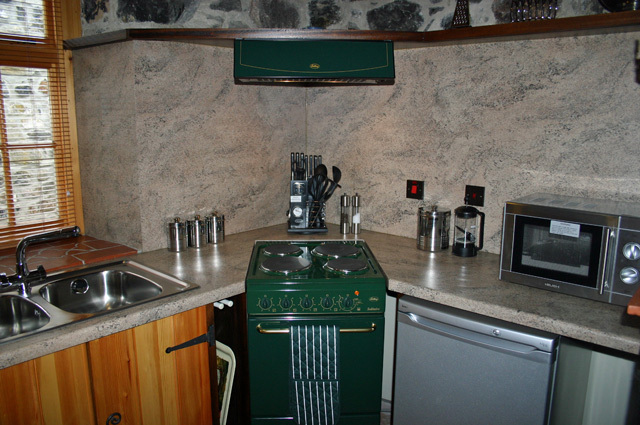 Kitchen equipment includes electric oven/hob, microwave, fridge with freezer compartment and toaster. One king size bedroom on a mezzanine gallery. Electricity, bed linen, quality feather pillows and duvets, towels and logs are included in the price. One pet welcome but please note there is no garden. Please note:- Because of the interior design of the Old Smiddy, we feel it is not suitable for babies/young children. 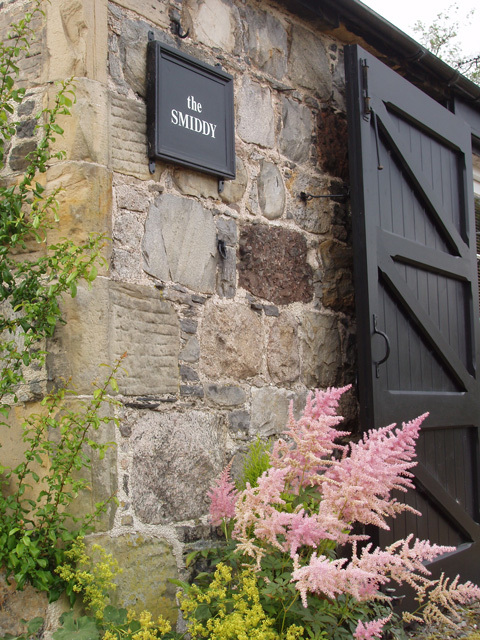 Looking for a quiet retreat in the Highlands, we came across the Old Smiddy. And we were not disappointed. It is a charming, beautifully restored, perfect get away from the madness of city life, with nights spent around the wood burning oven. It was exceptionally clean and the owners were a pleasure to talk to. Best of all, they knew exactly how to be hospitable without getting in your personal space during the stay. This is a rare quality. My only complaint was the absence of WiFi, which, for a techie like me would have been nice to have. But it cannot possibly detract from the little gem that is the Old Smiddy. My wife and I had a fabulous week at The Smiddy. The cottage hadn't changed since were were last there in 2008. 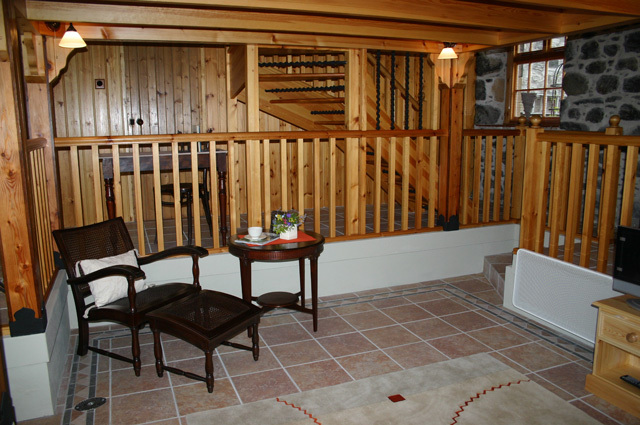 The amenities at the cottage are great, everything you need,just like at home. It is a great place to stay for a romantic break, Honeymoon,Anniversary or just to get away from the stress of busy city living. Inverness and the surrounding areas have a lot to offer and there is plenty to see and do. We had the pleasure of seeing Dolphins jumping and playing. Would stay again. 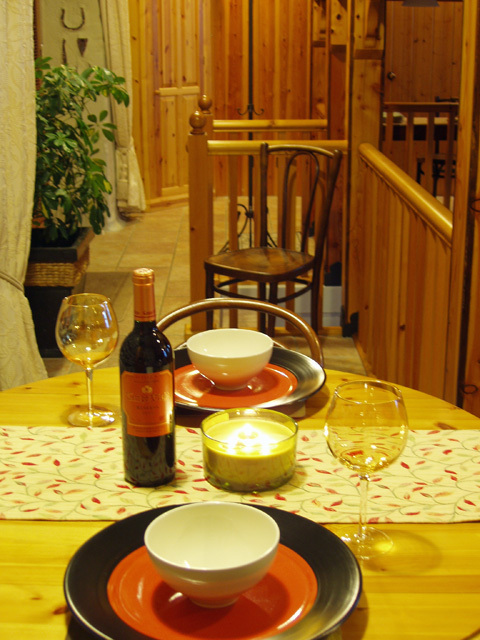 This is an excellent cottage, it has everything you could need, almost a home from home. It's very clean and the owners are very friendly. 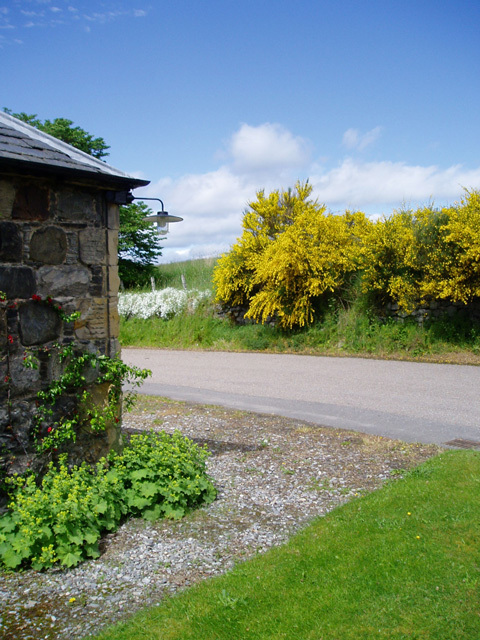 We had a great time and if we decide to visit this part of Scotland again we would book this same cottage again. Stayed at the Old Smiddy. The property is to the highest standard anyone could wish for. 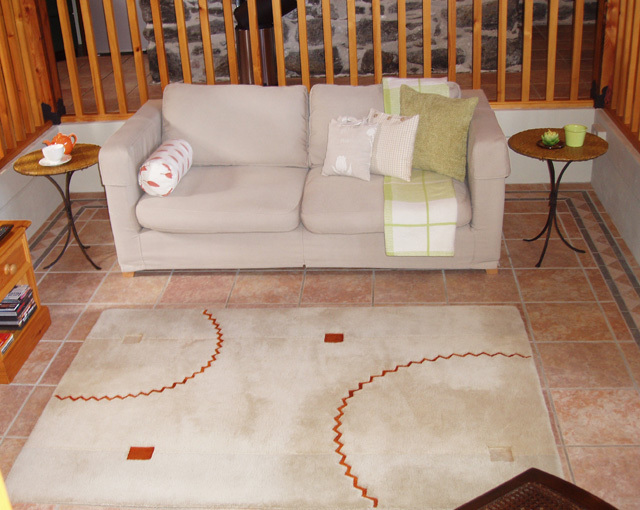 So clean and well presented, well equiped for a relaxing self catering holiday. Good location, plenty to see and do. We have just spent a very relaxing week in the Old Smiddy in Belladrum. 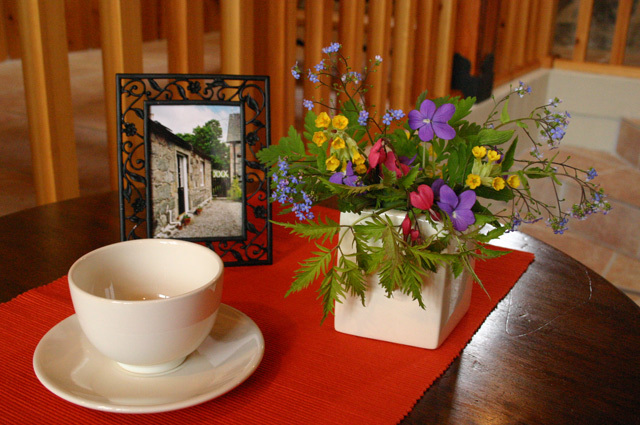 The cottage was beautiful and has everything you will need - and more! 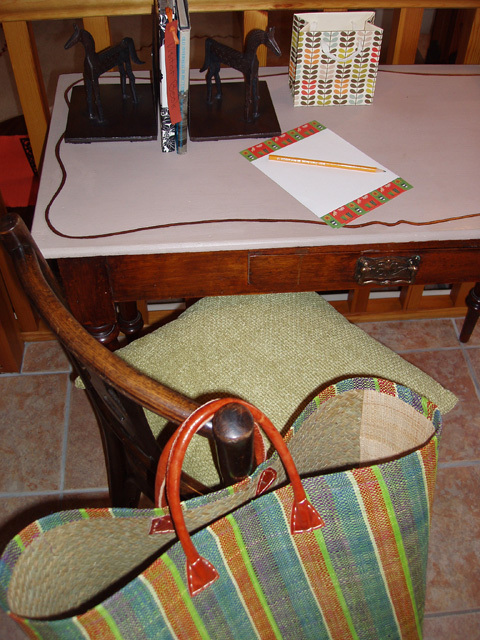 We were warmly greeted by the owner on arrival and shown where everything was. 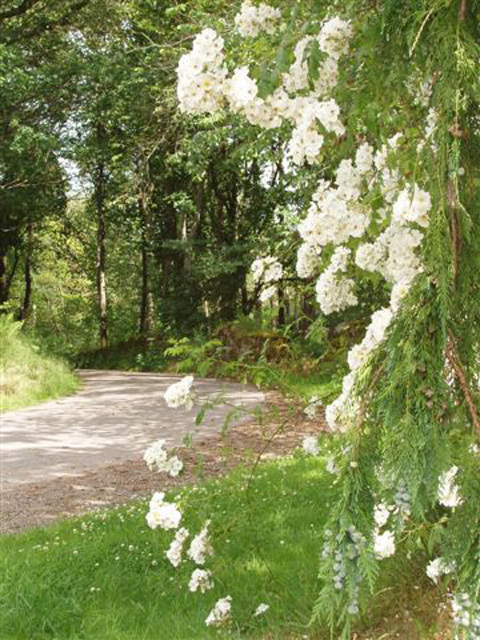 The little village of Belladrum is stunning and perfect for a quiet walk amongst the countryside. The town of Beauly is 5 miles away for shopping and the best chip shop - a chippy dinner is a must! This cottage is perfect if you want to get away from it all and relax!! An absolutely stunning cottage which was very cosy and comfortable with all amenities. An ideal location for exploring the Highlands. We would definitely recommend this place and pet friendly too which was even better. 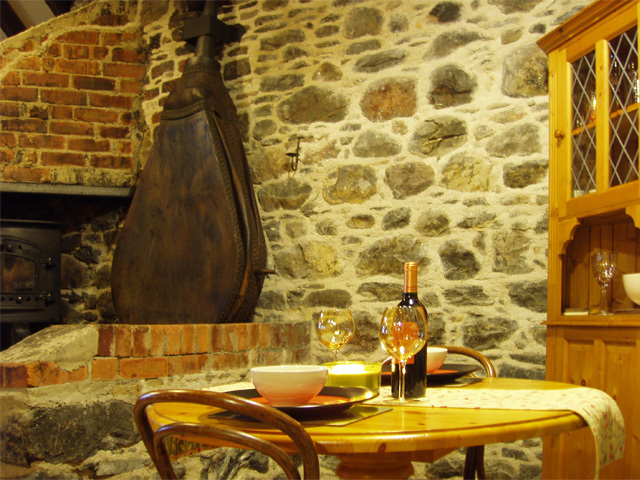 A wonderful character cottage for 2 - really clean and well equipped. The fresh air will make you sleep [and the comfortable bed helps!]. Had a really relaxing time and enjoyed the magnificent scenery. We have just returned from an autumnal week at The Smiddy near Beauly. Our first visit to the Highlands and we loved it! 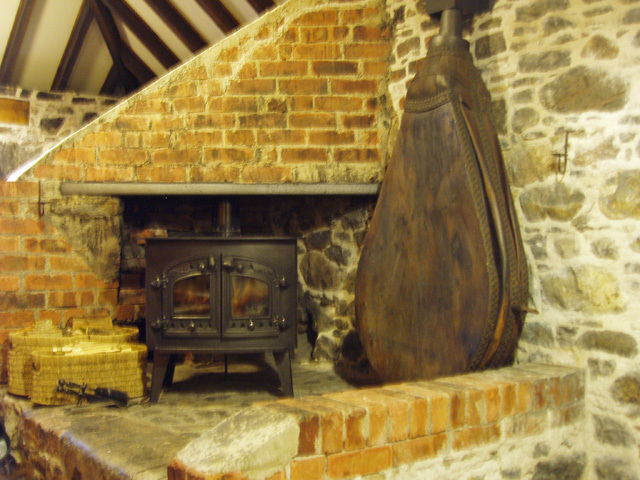 The Smiddy was stunning and very cosy - the wood burner and very comfy bed were our favourites. It was beautifully clean and tidy and absolutely our sort of place. Also a great base for exploring the area - we went to Glen Affric, Nairn beach and Dornoch for example. In fact the only thing that could have been improved on was the size of the bath towels - but such a small thing! What a fantastic find! This cottage is ideal for a couple and the pictures really dont do it justice. 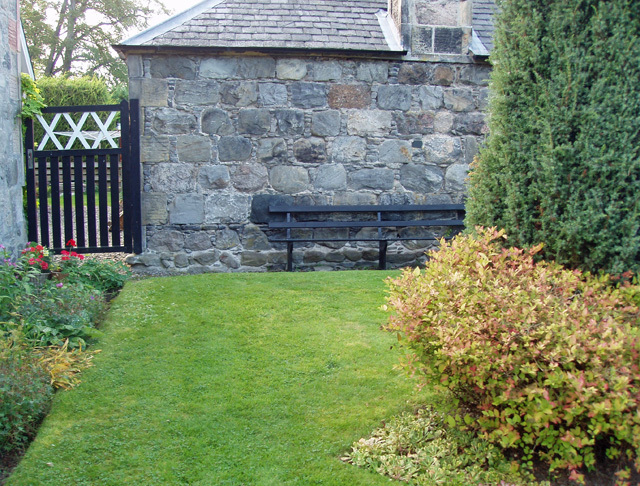 The cottage is based in a nice quiet area with a small village within walking distance. The location is great as its central to many great areas, including the stunning west coast. The cottage is very clean and well maintained, we felt like the first people to be staying there. Just returned from a blissful visit to The Smiddy. We had quite a bit of snow which made the log fire in the cottage all the more welcoming, but it didnt stop us getting out and about walking every day. 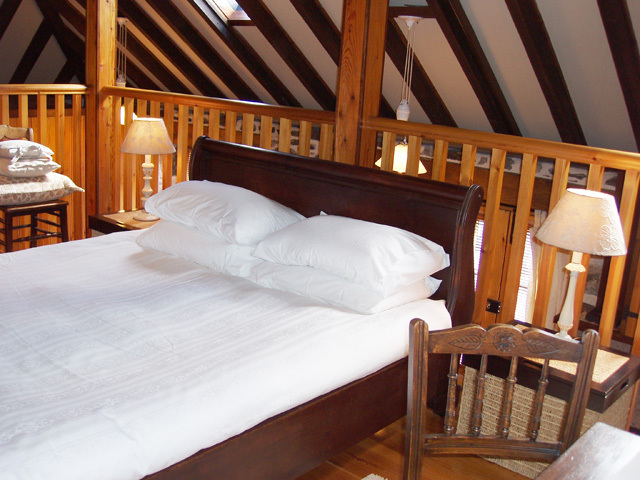 The cottage is very well appointed and has the most comfy bed you will ever sleep in! Location is perfect too as its not as remote as some cottages.But the peace and quiet is heaven if you want to escape your busy life in the town/city. We cant wait to come back again! We just wanted to say that we had the most amazing honeymoon in the Old Smiddy, made all the more special as we got married in The Belladrum Temple just half a mile away. We had the most perfect day and perfect stay on the Belladrum estate. We cant wait to return for our anniversaries. We stayed at the cottage from 8th-15th November 2008 and werent disappointed. The cottage itself was delightful with the attention to detail fantastic!! We found The Old Smiddy everything we were looking for. A great place for lazy mornings and evenings in front of the fire aswell as a great base for visiting the surrounding area. Our Westie Poppy also enjoyed her stay immensly and was extremely gratful for the welcome Bonio. We will be back. We had a fantastic honeymoon at The Old Smiddy and we would highly recommend it for a romantic getaway for two. We loved nothing better than coming back after a long days sight-seeing, lighting the log-burner and settling down with a nice glass of wine. The quality of the accommodation is really great (possibly the comfiest bed in the world?) and if youre looking for something just that little bit more special, this is the place for you. Its fantastically situated for just about anything youd want to do in the area. Whilst there, we visited Inverness, Glen Affric, took a Loch Ness cruise to Castle Urquart, had a brilliant scenic train journey to Plockton (and back) and drove through lovely scenery to Ullapool, which was one of the highlights of the trip. We really cant recommend it enough. We stayed at The Old Smiddy from 12th January 2008 to 19th January 2008. We had found the cottage on the Wilderness Cottages website and thought that it looked the perfect romantic getaway, we had high expectations for our break. We were not disappointed!! The pictures of the Smiddy (although lovely) did not do it justice, it was superb!! The decor was really beautiful and the attention to detail brillliant. The weather was not great while we were there (which was to be expected in January!!) and this was the perfect reason to stay in by the log fire with a nice meal and a bottle of wine!! We have not had such a relaxing holiday for a long time and will most definitely be back for a stay at a later date. We were so impressed that we have been looking on Wilderness Cottages for another one!! My husband booked this cottage in May for a week of our Honeymoon - It was a suprise honeymoon and I/we couldnt have asked or more. thank you for all your help in making it absolutely perfect. We stayed for a week in September and would definitely recommend The Old Smiddy. Its location is ideal, and there is so much to do in the area. The cottage itself is beautifully presented and really intelligently designed. Pat and Dave have also equipped it with everything you could possibly need. They have been really thoughtful, and theyre very friendly too. Our dog loved it too, with open fields just around the corner providing plenty of entertainment. We had a fantastic week at the Old Smiddy. It was so welcoming when we arrived. It was full of unique features and ideally situated to go off exploring. Pat and Dave are great and there if you need them for anything. Our dog Bella enjoyed her welcoming Bono Biscuit on her mat. 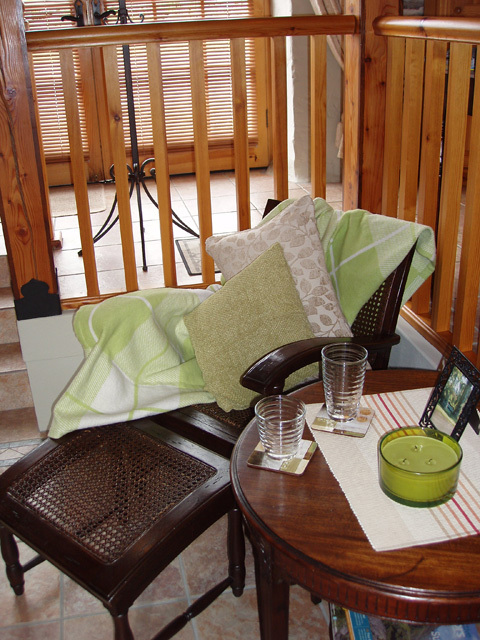 The cottage has everything you need for a relaxing romantic break away from all the stresses of everyday life. We hope to visit again in the future, we just loved it! We couldnt have asked for a better base from which to tour the highlands. Immaculately presented cottage with all mod cons but yet a million miles from the hustle and bustle of normal life. Wonderful. Wonderful stay in a wonderful property. Many many thanks to Mr & Mrs Gardiner for allowing us to book and stay. Beautiful place with everything you need. The wood finish is fantastic in the Smid, and all the facilities (kitchen, shower rooms) were more than first class. Lots to do and see around Inverness and Beauly, and the tasting session at the Winery was fine too. How depressing it was for us to leave. Thanks again to Mr & Mrs Gardiner, Corinne, and all the wondeful people of Inverness and Beauly.